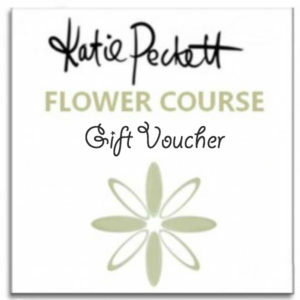 Katie Peckett Flower School, Sheffield - Flowers Sheffield from Katie Peckett. Quality flowers for your loved one. Katie Peckett passes on her expertise, experience and “Tricks of the Trade” in her specially designed and built flower school in Sheffield. For over 20 years Katie has had her ideas and designs featured in many leading organisations, magazines, theatres, arenas and wedding venues throughout Sheffield and the UK. Most recently commissioned for Elton John, The Rolling Stones and The Who concerts. Now you can learn to create one of her stylish designs. Only the most beautiful flowers and materials are used, sourced by Katie’s own in-house buying team. Overall a relaxed, fun and mind freeing course, culminating in something fabulous that you have made on the day to take home to admire with friends and family. Perfect for someone looking for a fun activity, on their own or with a group of friends, or for anyone wishing to join the exciting world of floristry. These sessions fill up quickly so please book early to avoid disappointment. This includes all materials (you take your beautiful creations home with you), complementary tea, coffee & cake. 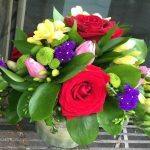 A gorgeous loose spring hand tied bouquet displayed in a fabulous Apollo fishbowl. Create an Easter wreath from Cineraria Eucalyptus, spring flowers and foliage, finished with an Easter twist. Straight from the potting shed! Create a charming spring time design using the finest spring stems in an Oasis base. Celebrate Peony season with our contemporary peony hand tied bouquet, accompanied by seasonal foliage and complementary flowers. Enjoy this Summer time terrarium design. Create the magic of your own mini ecosystem in a stylish glass terrarium, using luscious plants and accessories. Bring the joy of a summer garden into your home with our summer hand tied bouquet, using the best of the season’s favourite flowers and foliages. Nothing gets more striking then our tropical bouquets. Master the art of creating a contemporary gift bouquet complete in the stylish Katie Peckett signature gift wrap. Cosy on up this autumn with your very own loose and textured autumn wreath design, created using flowers and foliages from the rustic changing season. This autumnal favourite always brings a contemporary twist to your Halloween, Created using autumnal toned flowers and foliage. Sessions fill up quickly so please book early to avoid disappointment. Enjoy a bespoke evening flower arranging party for groups of 6 or more. Bring your home alive this year with our contemporary winter/Christmas wreath design class, created using a gorgeous blend of seasonal foliage and accessories. 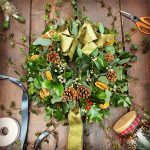 Winter wreath design- Bring your home alive this year with our contemporary winter/Christmas wreath design class, created using a gorgeous blend of seasonal foliage and accessories. Thanks Katie! Wonderful morning, flowers are absolutely gorgeous and it’s a lovely informal setting. You even made my effort look gorgeous. Thanks very much for a great morning. I’m very pleased with my first flower arrangement! Absolutly fabulous, such a fun morning 🙂 Perfect & love everything, especially the teacher. Have had such an amazing day. Thank you so much Katie! What a fun and creative day – A wonderful Christmas present. Thanks! A brilliant morning! Thank you for extending my skills.